Lena, Wisconsin—The benefits of annual cover crops, such as increased organic matter, soil porosity, and nitrogen creation, are well known. Over the past few years, pioneers in this field have championed “cocktail” mixes of a wide range of species, and they have achieved amazing results. Maybe it’s my inner researcher here, but something about cocktails has always bothered me. I think it’s the idea that it seems too easy. We plant a bunch of different things with the knowledge that something will grow and quite possibly thrive. My question has been this: What does each species bring to the table, and is there actual science we can use in formulating our cocktail blends? We attempted to begin answering this question by planting 10 species of potential cover crops in 20-by-10-foot blocs. The planting was done August 1, 2014 following a crop of triticale, so there was very little residual nitrogen in the plots at the time of the cover crop seeding. We applied 50 units of nitrogen at planting and had great fall growth on all the plots. In the spring of 2015 we tilled up the plots with a Howard Rotavator and planted the same variety of corn across all of the plots. We used another 20 units of nitrogen as a starter, but no other fertility was added. The goal was to keep the corn in a nutrient-deficient state to see how many nutrients were created or mobilized by the preceding cover crop. In August we collected tissue samples and measured the dry matter production from the corn. Dry matter yield per acre varied greatly, from 1,600 lbs. on a control plot that had no cover crop last year, to 8,000 lbs. on a plot that had been in Nitro radishes. 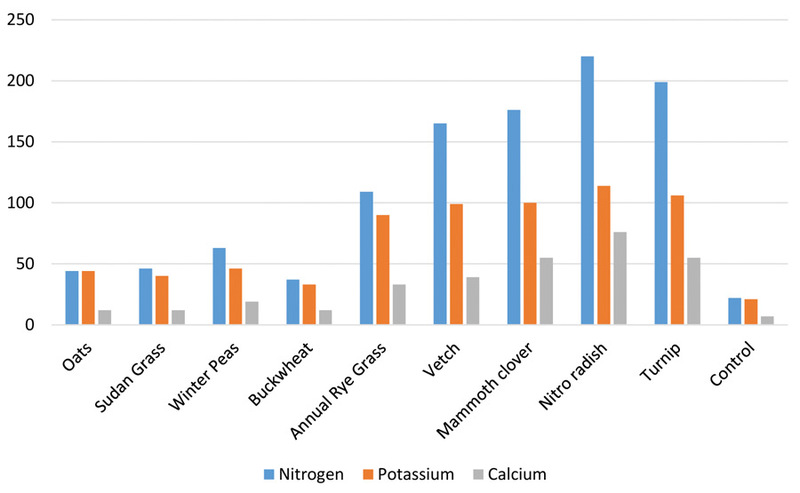 Nutrient percentages from the tissue samples were multiplied by the pounds of dry matter to determine how many total pounds of nutrients were provided by each of the cover crops. The results are in the chart below (left axis is total pounds of nutrients). At first blush my response was, “Why would I plant anything on the left side of this chart?” But after thinking about it, I realized the data should not be unexpected, and that it defines the two things that cover crops do best: nutrient mobilization and nutrient stabilization. Low-fiber species such as brassicas are amazing nutrient mobilizers. As they break down in the soil they quickly release their nutrients, in effect sending the soil’s metabolism into overdrive. In this case, they amazingly outperformed legumes in providing nitrogen in the corn plants. The negative side of this huge flush of nutrients is that it is not sustainable — especially when the corn is being mechanically harvested. We put only 70 lbs. of nitrogen and no P and K on these plots in the previous 12 months, yet we harvested hundreds of pounds per acre of these nutrients. If we are grazing this forage, the nutrients are largely recycled. 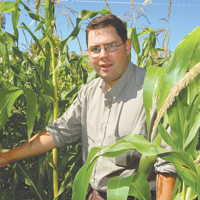 But if the corn is harvested as grain or silage, the benefits may be very short term. At the opposite end of the spectrum are high-fiber (carbon) crops such as sorghum, oats and sunflowers. If radishes act like urea, these are like pen-pack manure. They are nutrient stabilizers, and if our long-term goals are conservation along with increased organic matter and water-holding capacity, they need to be part of what we do. The reasons their benefits were not realized in this trial is that it was a short-term (one-year) study and each species was planted in a monoculture, which is discouraged by most experts. Given all of this, what should we plant this year? 1. I think there are real benefits to planting cocktails. They should include at least one brassica, one nutrient stabilizer such as oats, and one legume like vetch or clover. Other research has indicated that variety diversity within those categories could be beneficial. Just as we need to balance carbon-to-nitrogen ratios to make compost, we need to balance our cover crop species. 2. What is your cash flow situation? If you are concerned about surviving the next year, the mix should favor nutrient mobilizers/creators and have a limited amount of stabilizers. Use a heavier ratio of stabilizers if you are in a position to invest in long-term productivity. 3. What is your soil type/condition? Water is also a nutrient, and one that cover crops can help stabilize in your soil. If you are farming drought-prone soils, high-fiber crops could help do that. 4. If these mixes are being grazed, we have to think about palatability, fiber digestibility and protein content. Some high-fiber (carbon) crops are also high-quality crops, while others are not quite as good. I prefer BMR sorghum-sudangrass to millet, oats to sunflowers, and triticale instead of rye. Also, the improved brassica varieties are well worth the extra $2 per acre. 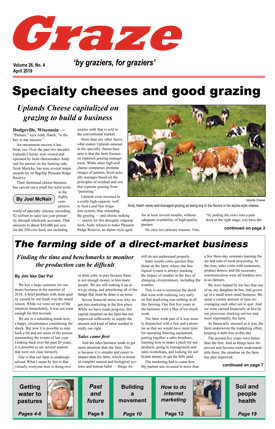 Daniel Olson milks cows, sells seeds and direct-markets from his farm near Lena, Wisconsin.